This is a bit overdue. But I put so much time into prepping for BookCon everything I put off came back to double wham me. Regardless. 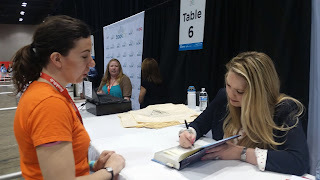 BookCon was....well, not at all like I thought it would be. I mentioned I wanted to use it for professional writing industry stuff - networking, feeling out publishers, and so on. BookCon is, after all, attached to the Book Expo of America which is a publishing industry event. And while I had a suspicion last weekend wasn't the best place for it, I still wanted to give it a whirl. I was excited about the author guests. Things sorta....derailed from the beginning. The event app and 'how to' articles people shared mentioned huge book hauls. Not that I minded that. 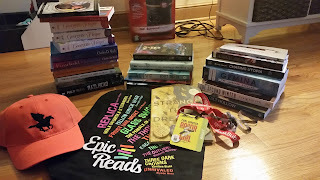 (I followed advice and brought a carry on suitcase - I needed it to bring back all my new books, as you can see.) But I was in line at 630 and learned that people had been there since 4 - signs of fans and not professionals. Indeed, I meet two parent/child couples in line. The kids were super excited to see YA authors. The parents were just drivers. I felt a little bad for one dad - he drove from Little Rock to Chicago and his only full day in the city was at Book Con. He was so surprised to learn 'adult authors' would be there too. I have to give him parenting kudos. Still, Reader Gwen was decently happy. My feet were aching by noon, but by signing up for newsletters I got arcs and small press authors were giving away books too. Most of what I was given however wasn't speculative. Who knows if I'll touch them. But I did find good deals on purchase prices. I didn't have a total bust of a day though - I talked to one publisher for a half hour, got a good understanding of how they worked and they'd read my manuscript for Stars if I'd send it to them. I found an author co-op, for small pub and indie authors, who pool funds and resources to promote their books. I found a publishing house linked to charity - who strives to provide copies of their books to classes for lessons - that resonated with what inspired me to write Stars. And I found another author whom I think I outlined his digital marketing campaign for...dang, he hasn't even sent me that coupon code for his book. What really caught my eye though was the quality of books. You could tell what was self-published and what wasn't - for the most part. There were a few at the co-op I didn't realize were self-published until I was told. It's not just cover designs, but the finish, the binding, the paper. Self-pub tend to be glossy finish with nothing on the spine, stark white and thin paper. I found myself going through small press booths and just touching books, marveling at the physicality of them. Matte covers in particular. Some of them had a slight fuzziness to the touch. It helped me visualize how I want Stars to be. All in all, it was a good experience. I'm glad I went. Will I go next year? Probably not. It's in NYC. Sorry it didn't meet your expectations, but it sounds like you got something out of it. Yeah, wasn't what I wanted but still good to go to. And I was surprised by how easy I could tell too. 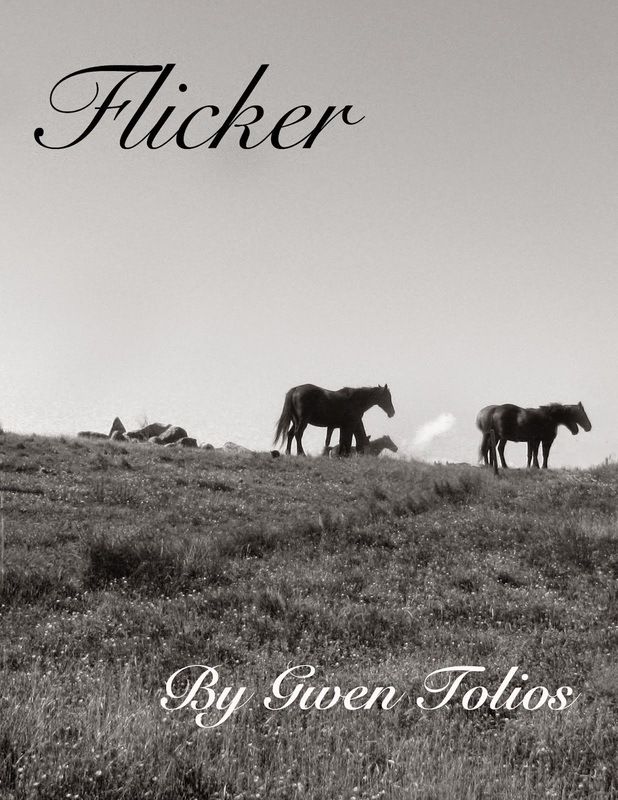 Most indie books I come across are digital, hard to tell the difference there. And don't worry about your summer glossys. Your writing is phenomenal. You'll sell.